METRAHIT BASE TRMS Voltage Multimeter. True RMS DMM. METRAHIT BASE TRMS Voltage Multimeter. 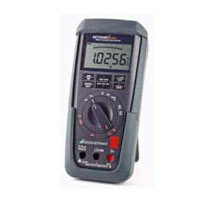 METRAHIT BASE 4½ place TRMS digital multimeter for industrial. Resolution: 12,000 digits. The transformation factor is adjustable from 1 mV:1 mA to 1 mV:1 A and is accounted for by the display.